Welcome! I'd like to introduce you all to some skills which I feel have not gotten proper representation, and that could be great with just some focus on them. And here's why.... but first: A quick set of pros and cons! The build utilizes the newly released quiver Maloney's Mechanism to allow us to trigger Mirror Arrow every time we fire Blink Arrow. As a result of this we can push out the maximum number of clones possible since we don't use any of the time that the skill would be off of cooldown to fire the other skill. Ease of use as well as damage rise significantly just from this one unique item. Neat! While this does mean we lose some damage as Mirror Arrow is restricted to a 3 Link, the overall damage is higher because it allows us to nearly double the number of mirror arrow minions. As well, the quiver gives chance to blind on hit and since your minions are hitting very often, most enemies will be blinded! "How the heck does it deal damage??" The damage from the minions comes primarily from Auras. 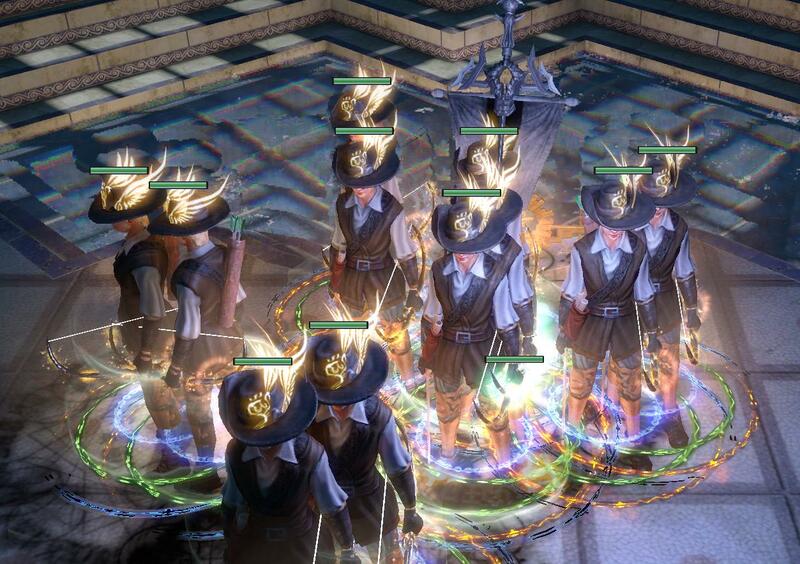 Using Victario's Influence allows us to run multiple auras that are greatly boosted for our minions. In this case, we focus on elemental damage auras, Wrath, and Anger, and speed boost via Haste. Lioneye's Glare and its "Hits Can't Be Evaded" mod helps MASSIVELY, primarily because minions have trash accuracy! With solid base DPS and making sure the minions don't miss, it's one of the best options available for a cheap price. A Powerful rare could likely outclass it, but that's the very expensive way to do it. As a result of this, each Blink and Mirror Arrow minion get about 110K DPS and 55K DPS respectively. Boosting our duration as high as possible allows them to be out for roughly 7 seconds. Combo the duration with 30% reduced cooldown recovery from the helmet enchant (Mirror Arrow) and the tree (Blink Arrow only, part of the Dark Arts Cluster). we can easily have 5 of each minion out at a time! To further boost their damage we use Elemental Equilibrium and hit with only cold damage, leading to enemies having -50% to both fire and lightning damage, the primary damage types of our minions.On top of that we have things like Tailwind, Intimidate from Tombfist, Flesh Offering, and a bit of bonus Impale from Dread Banner. Then we top everything off with a cool Reflection minion. Commandment of Reflection gives us a crazy strong minion that functions very similarly to Blink/Mirror arrow minions. It can't be supported by gems, but it does have a huge inherent damage bonus, giving it a DPS of about 78K. It's a relatively quick build, since your main damage skill is Blink Arrow, you'll be teleporting around constantly. Combined with a slight focus on evasion, enemies being blinded and even taunted by your minions with a Ghastly Jewel mod and lots of big damage minions, enemies commonly ignore you! That being said, you don't have a ton of life and your defenses are primarily chance based so avoid getting slapped if possible and you should do all right. Definitely not HC viable but solid for Softcore. WARNING: DO NOT LEVEL WITH THIS UNTIL YOU HAVE VICTARIO'S INFLUENCE! I tried to do it and it almost killed all drive I had towards the build. Since you're picking up Duration nodes, Toxic Rain is a great leveling skill until you get Influence Auras running. I had an exalt drop for me early in Synthesis and that served as the basis for the build. I was able to get most of the gear I currently have with just the 1 exalt. That being said, I'm not sure how much the price will fluctuate on the quiver. I would say that a safe estimate would be 1.5ex for everything, but likely less than that. "That doesn't seem like it would clear very well..."
It doesn't, with the damage setup. Swapping out Point Blank for GMP and/OR LMP helps tremendously. It's not an incredible clear speed, but I've found it to be more than capable even into red maps. "I don't believe you! Show me the PoB!" "What content has it done?" For once when making one of these: Yes! for Jewels: Repeat more of the same. You'll always have had used a minion skill recently. I don't have appropriately leveled gems just yet, but I'll have them eventually. For clearing, I swap out Point Blanks with GMP/LMP. Q: "Isn't this just the same as [other blink arrow build here] with Maloney's Mechanism?" A: Pretty much, but I haven't seen it updated for 3.6, or even 3.5. Those builds definitely inspired me but I'm primarily focusing on getting as many clones out as quickly as possible and having them last as long as possible, using new nodes, gear, etc. Q: "But why Mirror Models?" A: I'm a hipster when it comes to PoE, I don't have as much fun unless I'm doing something really unorthodox. Updated video link format and added T16 videos. IMO THE NEW QUIVER SHOULD BE USED AS A TRIGGER FOR HERALD OF AGONY/PURITY BY INSERTING IN RAIN OF ARROW + BLAST RAIN, WHICH WOULD ENHANCE UR DPS FURTHER AND GET DECENT LIFE ON IT FROM BLEEDING ENEMIES AS WELL. Hey are you sure the pierce from deadeye doesn't work with the clones? it for sure used to. I tested it out recently and unfortunately it does not. If I or my clones stand near an enemy, their shots don't pass through. If I shoot them, they do. Chain and +1 Projectile nodes also don't work. It's pretty frustrating as I'm only using pierce/lmp supports solely because those don't work even though the wording implies they should. Nice original build. Could look into Asenath's Mark/Chant maybe for more triggers. Most stuff doesn't work on minions unless it specifically says so. I agree the wording on the deadeye ascendancy isn't clear since it just says "Projectiles Pierece all nearby targets" - doesn't specify just for you. The one nice thing, however, is that unlike any other minion, they actually get your weapon and quiver, and all the effects on them. In this way, your choice of quiver is actually a huge detriment, because a penetrating arrow quiver will give you pierce. I have 5.6k life and 2.1k ES EB/MoM with this setup. I also get to run all the same auras you do and every 5 seconds my helm restores my ES. I didn't think about using the duration belt though, that is something I might look into. Is using Pierce support gem worth the DPS loss? I don't use it because I figured I get my pierce from Projectile Weakness.